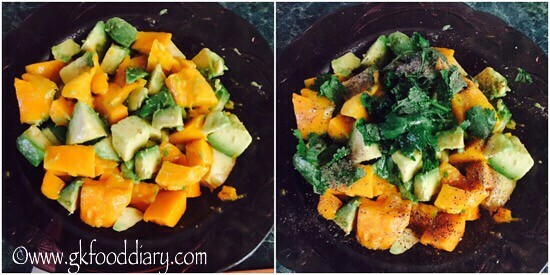 Avocado mango salad – a quick healthy salad recipe made with avocados and mangoes. 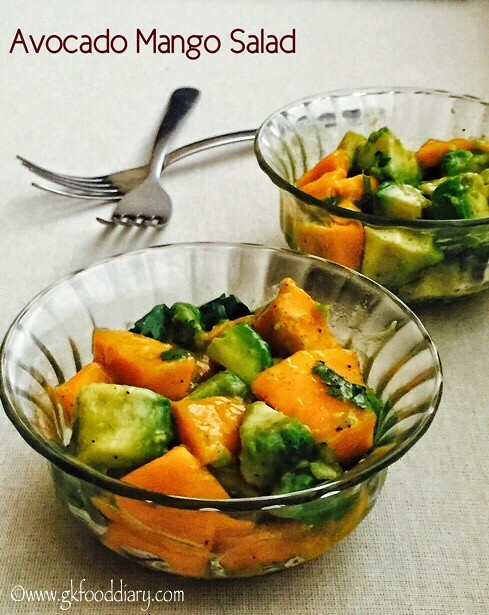 I have tried quite few recipes with avocados and this salad is my recent try. 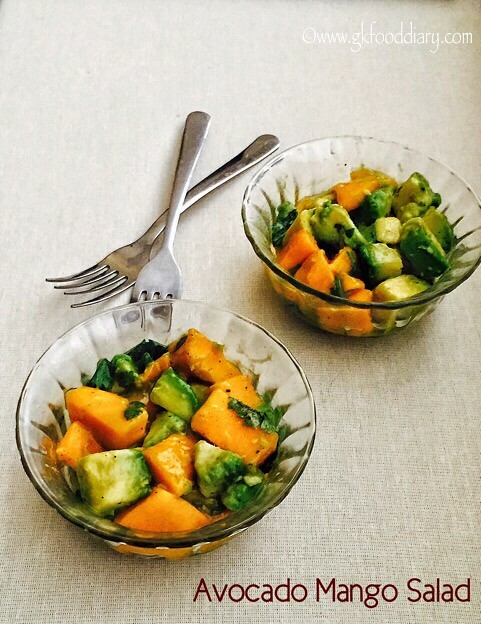 As avocados are bland in taste, combining it with mangoes gives a great taste:) This avocado mango salad is a great finger food for babies to encourage their self eating habit and it can be given from 9 months. For more information on selecting and storing avocados check here. 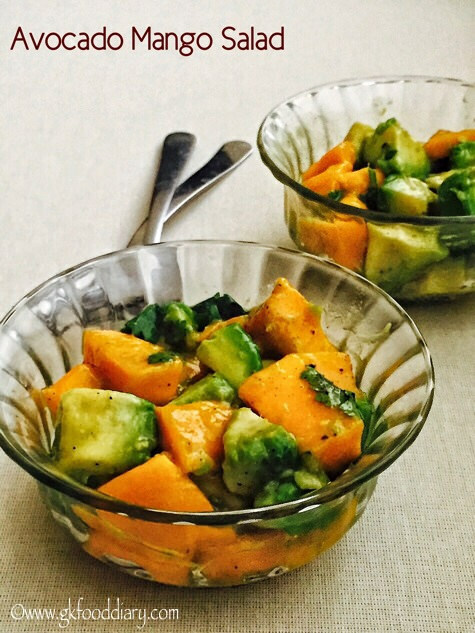 Here is how to make avocado mango salad for babies, toddlers and kids. 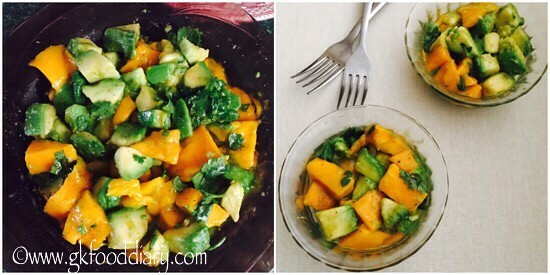 Avocado mango salad - tasty salad recipe with avocado and mangoes. Great finger food for babies. Keep all the ingredients ready. Wash mangoes & avocados in running water thoroughly. Cut the mangoes and avocados to cubes. Discard the outer layers and centre seed from both the fruits. Take juice from lemon and chop corainder leaves. Set aside. Collect the cubed avocados and mangoes in a bowl. Sprinkle pepper powder, olive oil, salt, honey, lemon juice and corainder leaves. Toss it well with a spoon and serve it immediately. 1. Keep all the ingredients ready. Wash mangoes & avocados in running water thoroughly. 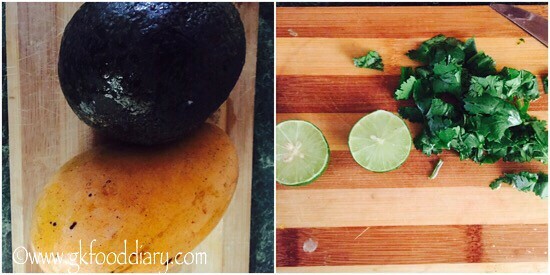 Cut the mangoes and avocados to cubes. Discard the outer layers and center seed from both the fruits. Take juice from lemon and chop coriander leaves. Set aside. 2. Collect the cubed avocados and mangoes in a bowl. Sprinkle pepper powder, olive oil, salt, honey, lemon juice and coriander leaves. 3. Toss it well with a spoon and serve it immediately. 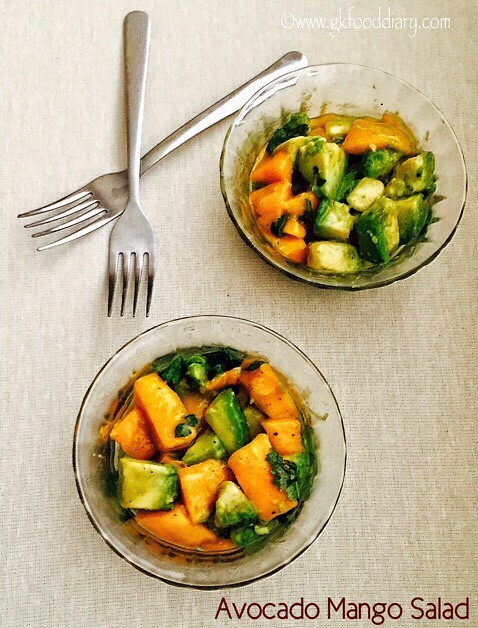 The healthy avocado mango salad is ready. Choose ripe avocados and sweet tasting mangoes for best results. Otherwise it may taste bitter. You can add any fruits of your choice to make this salad. 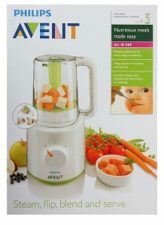 Skip olive oil, honey and salt for babies below one year. Make sure to introduce avocados and mangoes separate before you try this avocado mango salad to your baby.